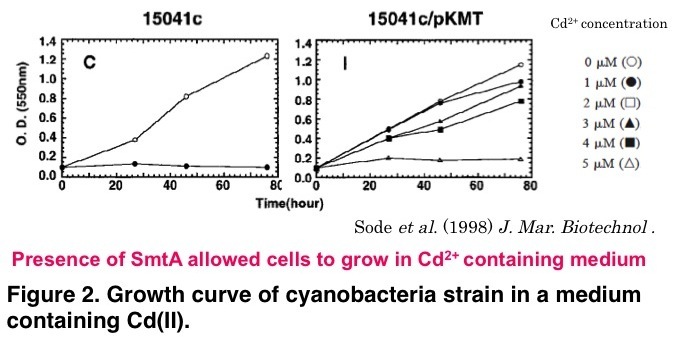 The data above, taken from a paper (Sode et al., 1988), shows that a cyanobacterial strain was able to tolerate medium of high Cd(II) concentration when it harbored the smtA gene. For our iGEM project this year, we have successfully observed that SmtA, expressed under a constitutive promoter (J23109) work very well. We plotted a graph of growth rate by looking at the OD595 every 1 hour, and compared the growth of wild type E. coli and SmtA expressing E. coli. As a result, we found that E. coli expressing SmtA grow better than the WT E. coli at a high Cd(II) concentration.